Origin and Habitat: Peruvian region of Ancash and La Libertad (valleys of the Rio Puchca, Rio Mosna, Rio Huari, and Maranon). Extent of Occurrence is less than 2,500 km2, and occurs in less than ten locations. Altitude:1800-2800 metres above sea level. Habitat and ecology: It is both solitary or in groups and occurs in inter-Andean valleys. 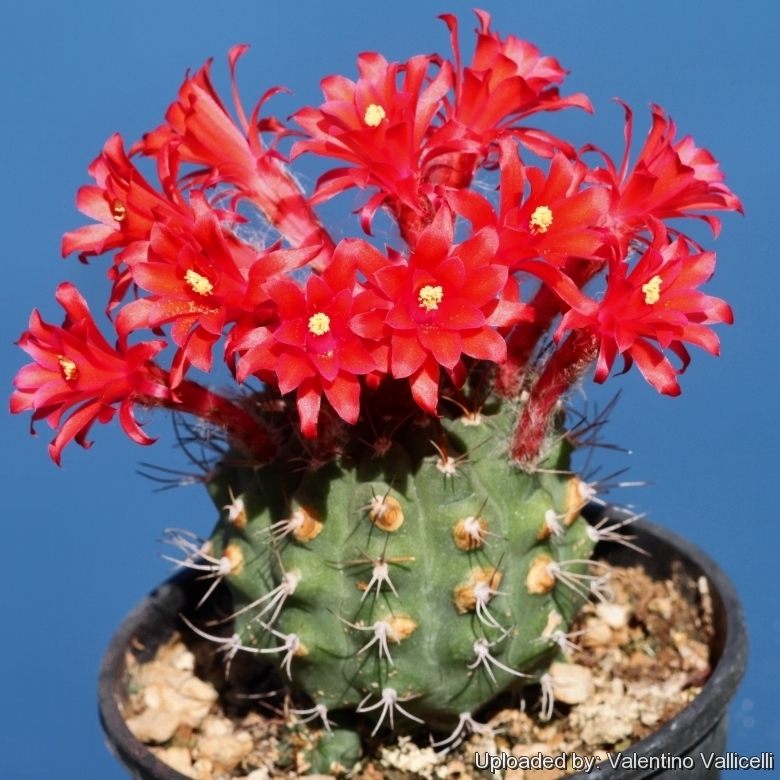 In this area grow other related matucanas such as Matucana madisoniorum, Matucana calliantha, Matucana tuberculosa and Matucana formosa. It is not frequent, but not rare either. The population seems to be decreasing due to illegal collection. 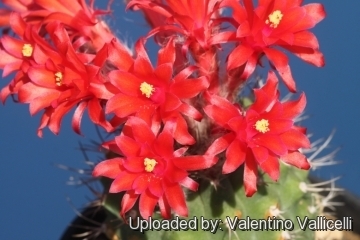 Description: Matucana paucicostata is a sparse ribbed globular cactus often branching basally to form small clusters. 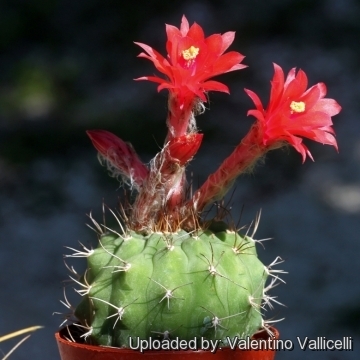 It is one of the smallest Matucana species. The plants mature and start flowering at the size of a nut (3-4 years from seed), and generally do not overgrow the sized of a small apple. Stems: Globose when young slowly becoming short cylindrical, dark grey-green, notched and tubercular, 7-15 cm high, 4-7 cm wide. Ribs: 7-11, broad, straight, forming conical tubercles. Spines: Reddish brown, turning grey with age, bended, somewhat flexible. Central spines: Single (often missing), up to 30 mm long. Radial spines: 4 to 8, 5-30 mm long. Flowers: Very showy, almost vertical on the stem apex, purplish pink to carmine red, funnel shaped, long-necked, slightly curved (zygomorphic), 6 cm and 3 cm in diameter with a tight bunch of filaments around style. Petals, margined, dark vermillion and violet, with gentle changing colour shades, flower tube white hairy. Phenology: Large plants usually produce small bouquets of 5-10 blooms at time, forming pretty crown. Flowering period summer (June–July in northern hemisphere) but in favourable conditions some flowers may appear from early spring to late autumn. Fruits: Green, sparse hairy, approximatively 11 mm broad. 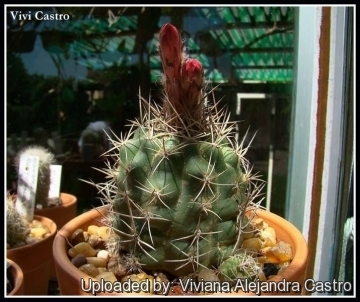 Matucana caespitosa n.n. : is an undescribed name used commercially to indicate one of the local forms of Matucana paucicostata (same as the type). Distribution: Rio Huari, Peruvian region of Ancash. 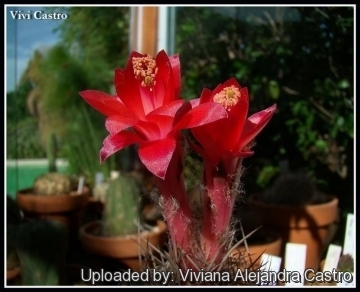 Matucana paucicostata F.Ritter: has globular stems branching basally. Flowers purplish pink to carmine red long-necked, slightly zygomorphic. Distribution: Rio Puchca, Rio Mosna, Rio Huari, and Maranon, Peruvian region of Ancash. 6) Ostalaza, C. & Roque, J. 2013. 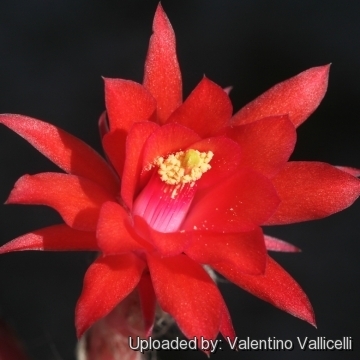 Matucana paucicostata. The IUCN Red List of Threatened Species. Version 2015.2. <www.iucnredlist.org>. Downloaded on 18 August 2015. 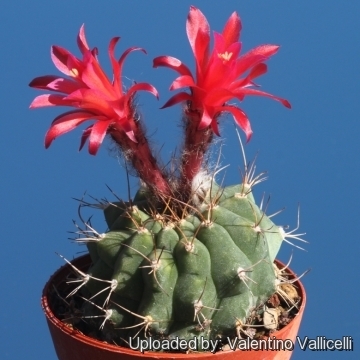 Cultivation and Propagation: Matucana paucicostata is an easy to grow ornamental species suited for any well drained soil in half or full sun. Growth rate: It is a small growing species, but it it possible to increase the speed of growth to some extent by providing adequate amount of water, warmth, and fertilizer during the active growing season, but it’s susceptible to rotting if too wet and do not like a lot of water when it is on rest. Soil and pots: It likes deep pot with generous drain holes to accommodate its tap root, needs a very airy potting medium very permeable to water which mainly consists of non organic material such us clay, pumice, lava grit, expanded slate and only a little peat or leaf-mould, slightly acid, pH-value between 4,5–6. Re-pot every two years. Propagation: The plant can be reproduced by seeds or cuttings. If you remove an offset, remember to let it dry for some days, letting the wound heal (cuttings planted too soon easily rot before they can grow roots). Lay it on the soil and insert the stem end partially into the substrate. Try to keep the cutting somewhat upright so that the roots are able to grow downward.